Affectionately known as “Death Valley” for the fate the visiting team so often meets, Louisiana State University’s 102,000-seat Tiger Stadium has run a Danley Sound Labs sound reinforcement system for the past two seasons. Notable for the high output of its Danley Jericho Horns, which successfully compete with the legendary roar of Tiger fans, the system is also remarkable for its clarity and musicality. 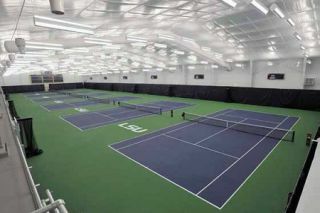 LSU’s brand new tennis facility features six indoor and 12 outdoor courts with seating for 550 fans. With enthusiastic support from fans, staff, and administration, Terrance Bold, LSU’s assistant director of facilities and grounds, has subsequently made it his mission to bring all of LSU’s other athletic facilities up to the same standard. To date, LSU has installed Danley systems at its softball field, indoor track, swimming facility, and indoor and outdoor tennis facilities, and Bold is slated to place another Danley system in LSU’s gymnastics facility very soon. For most of those new systems, Bold also upgraded the amplifiers and processors to Ashly Audio, citing their proven 24/7 reliability. Bold’s background is in audio engineering and live mixing, and he’s the guy behind the console for all LSU home football and basketball games. Moreover, he’s a passionate audiophile who wants LSU fans to get the same kick out of their listening experience on game day that he gets listening to his tweaked hi-fi at home. Richard Hale, president of local AV integration firm Sound Advice, and various members of the Danley team have assisted Bold in his quest to redo LSU in the sonic image of Tiger Stadium. LSU’s brand-new tennis facility features six indoor and 12 outdoor courts with seating for 550 fans. Bold jumped at the opportunity to outfit it with Danley loudspeakers and Ashly amplifiers and processors. Indoors, he placed three clusters, each composed of a Danley OS-115 subwoofer above two Danley OS-90 loudspeakers, equally spaced along the east wall. Outdoors, he placed a total of eight OS-115s and eight OS-90s from light poles on the center aisle between two rows of tennis courts. Bold pulled out underperforming systems in other existing venues and replaced them with Danley systems. LSU’s softball facility chucked 32 loudspeakers in favor of two Danley OS-90s, which deliver significantly greater total output with greater clarity. The indoor track uses a center cluster of four Danley OS-80s along with existing subwoofers and new Ashly amplifiers. LSU’s indoor swimming complex now uses six Danley OS-90s, new Ashly amplifiers, and, given the room’s impossible low-end reverberation, no subwoofers. In the near future, Bold will replace the sound system in the gymnastics facility with four Danley SBH-20LF full-range loudspeakers and two TH-118 subwoofers, along with new Ashly KLR-Series amplifiers.